Brown hamburger and onion. Put in bottom of a 8x11 casserole dish. Mix milk and soup and pour over meat, then layer beans, potatoes, and finally the cheese over the meat mixture. Bake in 375 oven for 20 minutes or until mixture is bubbly and cheese is melted. 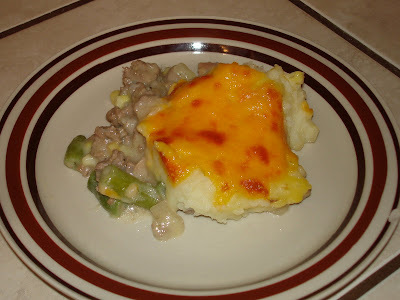 My family calls this "Hannah's Shepherds Pie" this is my sister Hannah's favorite recipe and it's one that she always makes. There are a lot of variations on this recipe. I have seen in made with tomato soup and mixed vegetables. I usually make something on Sunday that has to do with mashed potatoes and I make extra so I can put the extra in a freezer ziplock bag and use the potatoes when I need them. (Mashed potatoes freeze really well) This time I added some corn that I had leftover in the fridge.